One of the most stylish and unique choices for a bride-to-be is a cushion cut engagement ring. The shape is reminiscent of a vintage era from long ago, but it has also been revived by jewelry designers who know how popular this type of ring can be. Cushion cut diamonds are stunning in every way. Their pillow shaped stone with gorgeous facets makes it a perfect alternative to the usual princess or round brilliant choices. They are especially versatile because they can be used where both round and square stones are used–doubling your options instantly. The rounded corners and longer shape make this type of engagement ring stand out in the crowd without looking too trendy or unusual. While cushion cut engagement rings may be a little more difficult to find in regular jewelry stores, they are certainly well worth the search. Opting for a cushion cut engagement ring is a brilliant and beautiful choice for the discerning, classy woman. One of the most popular choices for this type of cut is the simple solitaire (or a solitaire with tiny accent stones). As with all solitaire settings, they allow for the true beauty of the stone to shine forth on its own without distractions from multiple side stones. A solitaire is one of the best ways to show off this unique diamond. 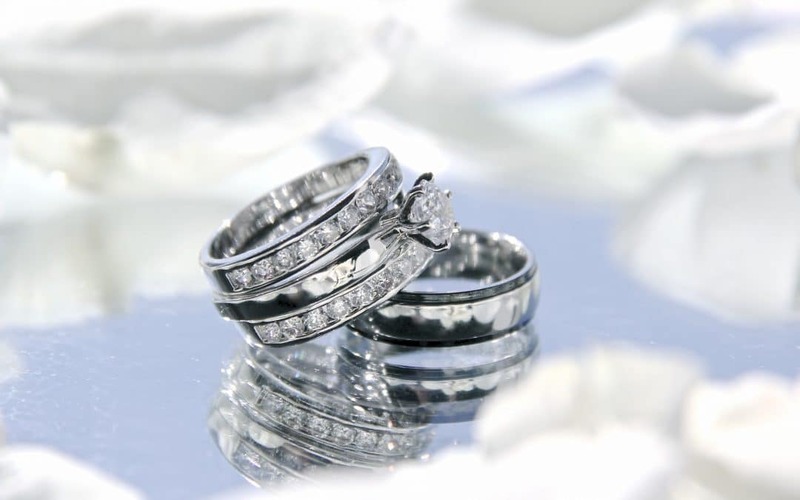 As well, solitaires should generally be more affordable than many other rings with side stones. Another beautiful way to wear a cushion cut engagement ring is to pair it with some side stones. Generally these types of settings have much smaller side stones to enable the main stone to stand out as much as possible. 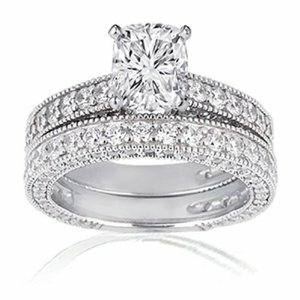 A beautiful way to add extra flair to a ring is to surround the center stone with small diamonds in a halo arrangement. This type of setting is a fantastic way to make a smaller stone appear much larger–and making your budget stretch much further. For women who love more of a vintage flair, this is an excellent choice. Vintage and antique designs are popping up everywhere these days and make for a stunning and classic option. Please note that there can be issues with the tiny stones falling out more frequently in this reasonably delicate setting. The upside of this ring is the three rows of diamonds create a glamorous look and allow for a wider band (and possibly making purchasing an additional wedding band unnecessary).